More than thirty years after its initial release, Stanley Kubrick’s 2001: A Space Odyssey still inspires those who see it. Like a piece of fine art or a classical symphony, its appeal has only grown over time. A strikingly unique film, it captivated a generation of young people in the late 1960s, who accepted its visual message with religious fervor. Initially rebuffed by leading film critics, 2001 is today considered one of cinema’s greatest masterpieces. An epic story spanning both time and space, 2001 begins four million years ago, in a prehistoric African savanna, where mankind’s distant ancestors must learn how to use the first tools in order to survive. The film cuts to the technological utopia of the early 21st century, where life in outer space is an everyday reality. The story then takes us to the first manned space mission to Jupiter, which consists of two human astronauts and a super-intelligent computer named HAL. The final segment of the film contains a fantastical 23-minute light show of special effects and a mystifying conclusion designed to make its audience question themselves and the world around them. Director Stanley Kubrick, who is also known for films such as Dr. Strangelove, A Clockwork Orange, and Barry Lyndon, first approached science fiction writer Arthur C. Clarke in early 1964 to collaborate on what both hoped would be “the proverbial good science fiction film”. They spent a year working out the story, and Kubrick began pre-production in the mid-1965. On the recommendation of Clarke, Kubrick hired spacecraft consultants Frederick Ordway and Harry Lange, who had assisted some of the major contractors in the aerospace industry and NASA with developing advanced space vehicle concepts, as technical advisors on the film. Ordway was able to convince dozens of aerospace giants such as IBM, Honeywell, Boeing, General Dynamics, Grumman, Bell Telephone, and General Electric that participating in the production of 2001 would generate good publicity for them. Many companies provided copious amounts of documentation and hardware prototypes free of charge in return for “product placements” in the completed film. 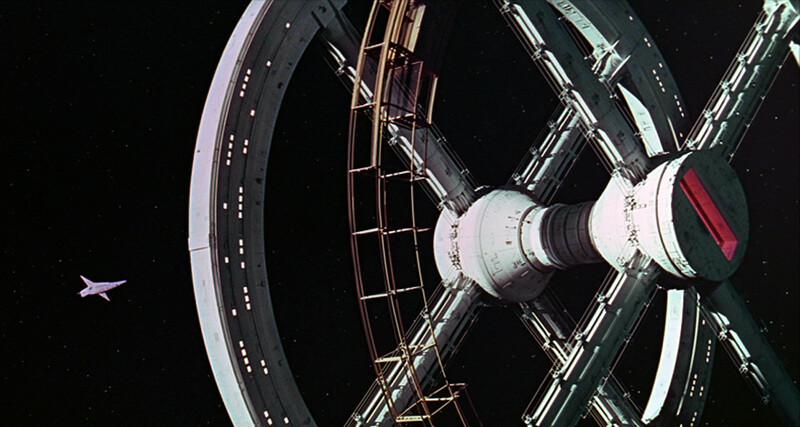 They believed that the film would serve as a big-screen advertisement for space technology and were more than willing to help out Kubrick’s crew in any way possible. Lange was responsible for designing much of the hardware seen in the film. Models were used for many scenes involving spacecraft. Every detail of the production design, down to the most insignificant element, was designed with technological and scientific accuracy in mind. Senior NASA Apollo administrator George Mueller and astronaut Deke Slayton are said to have dubbed 2001‘s Borehamwood, England production facilities “NASA East” after seeing all of the hardware and documentation lying around the studio. Even today, most audiences and critics still find 2001‘s props and spaceships more convincing than those in many more recent science fiction movies. While earlier science fiction films had aimed for a streamlined “futuristic” look, 2001‘s production design was intended to be as technically credible as possible. Production designer Anthony Masters was responsible for making Harry Lange’s design concepts a reality. More than a hundred modelmakers assisted him and the other members of the art crew in this task. For greater authenticity, production of many of the film’s props, such as spacesuits and instrument panels, was outsourced to various aerospace and engineering companies. Everything had to meet with Kubrick’s approval before it could be used in the film. Kubrick’s unrelenting perfectionism was evident when it came to designing the mysterious alien monolith, which appears at various points throughout the film. Originally envisioned as a tetrahedron, none of the models were impressive enough. Kubrick then commissioned a British company to manufacture a three-ton block of transparent lucite, which also lacked the necessary visual impact. The black slab finally used was constructed out of wood and sanded with graphite for a completely smooth finish. It was not unusual for the crew to go to great lengths to create the film’s unique sets. The film’s’ most impressive set is that of the interior of the spaceship Discovery. To compensate for the weightlessness of outer space, the ship’s crew compartment was envisioned as a centrifuge that would simulate gravity through the centripetal force generated by its rotation. A 30-ton rotating “ferris wheel” set was built by Vickers-Armstrong Engineering Group, a British aircraft company at a cost of $750,000. 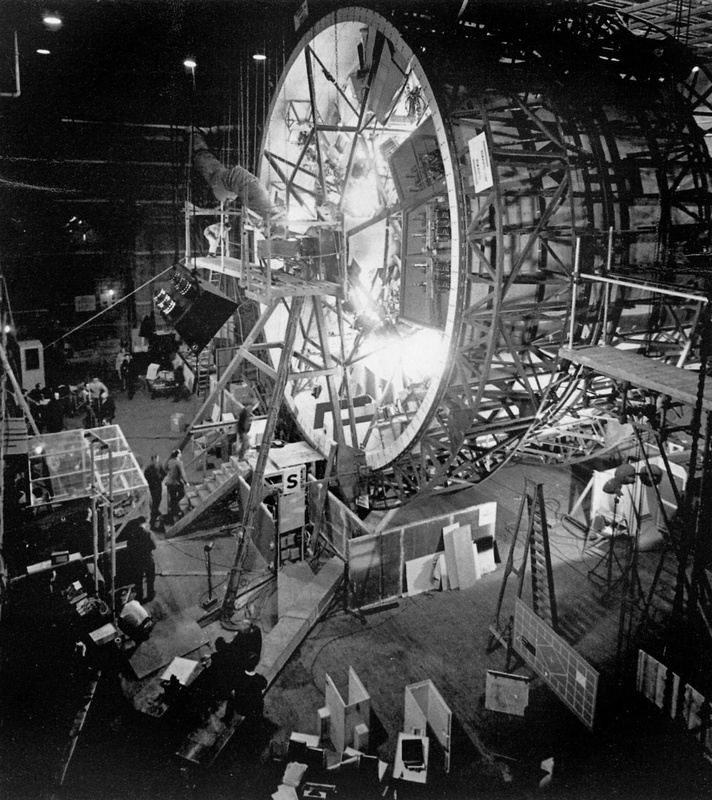 The set was 38 feet in diameter and 10 feet wide. It could rotate at a maximum speed of three miles per hour, and was dressed with the necessary chairs, desks, and control panels, all firmly bolted to the inside surface. The actors could stand at the bottom and walk in place, while the set rotated around them. Kubrick used an early video feed to direct the action from a control room, while the camera operator sat in a gimbaled seat. 2001 was one of the first films to make extensive use of front projection, a technique where photography is projected from the front of the set onto a reflective surface. The prehistoric Africa scenes were actually filmed in the Borehamwood studio, with second unit photography projected onto a screen behind the actors measuring 40 feet by 90 feet to provide the illusion of an outdoor scene. Front projection was also used for some of the film’s outer space effects scenes. The more traditional technique of rear projection was reserved mainly for the many video displays and computer monitors that appeared in the film. Although most of the visual effects techniques used in 2001 had been used before, there was one sequence that broke new technical and artistic ground. The “Star Gate” seen in the final segment of the film, where a stream of whirling lights colors streamed around amazed theater audiences, was created using a “Slit Scan” machine developed by Douglas Trumbull, which allowed the filming of two seemingly infinite planes of exposure. Additional effects for the sequence were created applying different colored filters to aerial landscape footage and filming interacting chemicals. Other effects were achieved through a combination of creative camerawork, hard work, and dedication. To make a stray pen “float” in a weightless environment, it was attached to a rotating glass disk. The illusion of astronauts floating in space was created by hanging stunt performers upside down with wires from the ceiling of the studio, often for hours at a time. The achievements of 2001‘s effects, which were all done without the benefits of computer technology, are nothing less than amazing. Kubrick held his crew to the highest standards to insure that the film’s effects were designed to be as realistic-looking as possible. To insure that every element of an effects scene was as sharp and clear as a single-generation image, he ruled out the use of many techniques that would have been much faster and less expensive. $6.5 million of his $10.5 million budget ended up going toward effects alone, and it was nearly two years after the end of principal photography that film was finally finished. When audiences first saw 2001 in the spring of 1968, many were baffled. The film lacked a traditional plot structure, contained almost no dialogue, and had an ending that many found confusing. Leading film critics, like Andrew Sarris and Pauline Kael, panned the film, arguing that Kubrick had sacrificed plot and meaning for visual effects and technology. Young audiences soon discovered the film, however, and it became a huge commercial success. The glowing reviews of many younger critics prompted many of the film’s detractors to give it a second chance, and some even retracted their earlier reviews. Articles and books were written, all containing different interpretations of just what the film’s message was. Many agreed that with Stanley Kubrick’s suggestion that as a visual masterpiece, 2001 is intensely subjective and cannot be objectively explained, much like one cannot “explain” Beethoven’s Ninth or Leonardo’s La Gioconda. The film inspired many, who have said they became filmmakers, engineers, or scientists as a result of seeing 2001. Even today, 2001 continues to be a part of people’s lives. Films and television commercials consciously evoke its imagery, countless fans post their thoughts about it on the Internet, and articles like this one continue to be written about it. It is a testament to the genius and dedication of Kubrick and his crew that the future they so meticulously constructed still looks so convincing. Agel, Jerome, ed. The Making of Kubrick’s 2001. New York: New American Library, 1970. Bizony, Piers. 2001: Filming the Future. London: Aurum Press, 1994. Lightman, Herb. “Filming 2001: A Space Odyssey”. American Cinematographer, vol 49, no 6. Original content © 1994-2016 George DeMet. This website may at times present copyrighted material, the use of which might not always been specifically authorized by the copyright owner. Such material is made available in an effort to advance understandings of democratic, economic, environmental, human rights, political, scientific, and social justice issues, among others. The author believes that this constitutes a “fair use” of any such copyrighted material as provided for in section 107 of the U. S. Copyright Law. In accordance with Title 17 U.S.C. Section 107, the articles published on this website are distributed without profit for research and educational purposes. Questions about the licensing or usage of images or other copyrighted material from 2001 should be addressed to the Clip & Still Licensing Department at Warner Bros. Entertainment, Inc.